Coll. No. 1914, 3 June 2018, characters observed: Perennial, herb, to 40 cm., caudex, 12 mm., elongated rather than button-like; Stem, tomentose, thinning above but never glabrous; Leaves, basal and cauline, (largest) basal leaf, petiole 30 mm., blade 57 mm. × 19-20 mm. wide, some pinnatisect, with 2 pair of lobes, most basal leaves orbicular or oblong, margin crenate, sometimes doubly, petiole and mid-vein tomentose, highly variable, eglandular, cauline leaves reduced above into the inflorescence; Inflorescence, heads, ±30 per stem; Involucre, 5 mm. × 7.5 mm. wide, spheric; Phyllaries, in 1 series, 5.5 mm. × 1 mm. 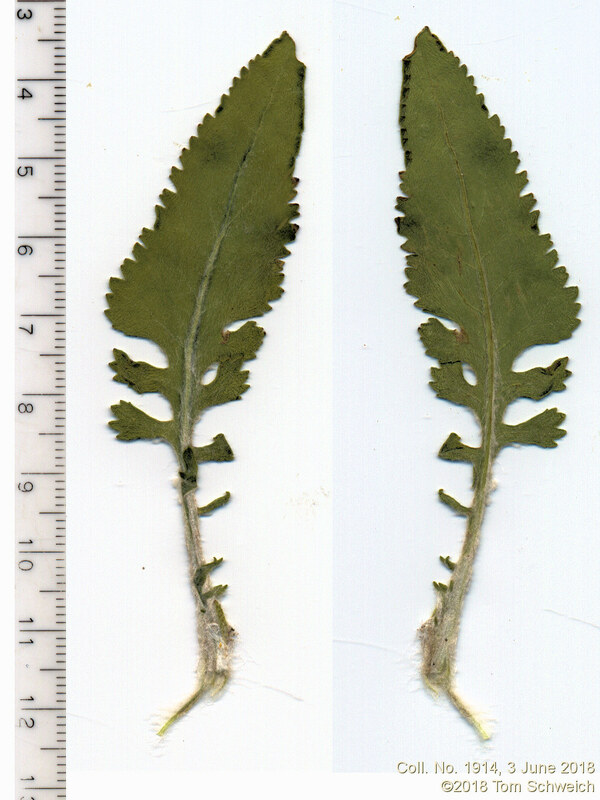 wide, green and chartaceous, thinly tomentose, margins, flat, scarious, tips, acuminate, green, with tufts of hair; Receptacle, epaleate; Flowers, 2 kinds; Ray flowers, #13, tube 3 mm. + blade 6.5 mm. × 2.5 mm. wide, tips deeply cleft, to 1.5 mm., yellow, fertile; Disk flowers, many, tube 3.5 mm. + lobes 0.5 mm., yellow; Pappus, many, well-developed, bristles, 4-5 mm., ±equal; Fruit (cypsela), 2 mm. × 0.5 mm. wide, beak-less, brown, ribbed, pubescent on ribs. Field Notes: Coll. No. 1914, 3 Jun 2018.